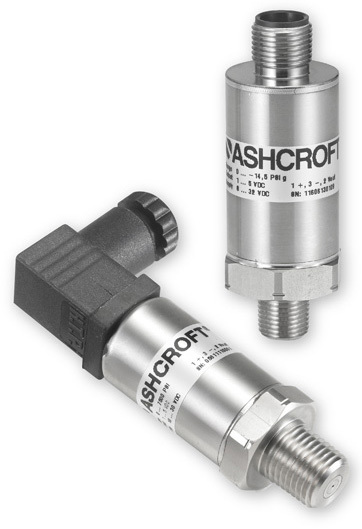 The KD41 stainless steel pressure sensor by Ashcroft features 1000‑g shock resistance and 20‑g vibration resistance. The measuring range of the KD41 pressure transducer is up to 1378 bar. The accuracy (total error band) is ±2 % specified for the temperature range from -40 °C to +105 °C. Typical applications include hydraulic and pneumatic sensing in off-road vehicles as well as in heating, ventilation, and air-conditioning systems. The transducers are equipped with a CAN interface supporting CANopen (CiA 404) and J1939 connectivity. The CANopen version is available with and without integrated termination resistors including a split termination. The used vendor‑ID is 439 (ADZ). The measured data can be given in integer16, Integer32, and Real format. Additionally, the process value can be time-stamped. The J1939 version uses proprietary a PGN (65330). The manufacturer‑ID is 455 (Ashcroft Nagano). The J1939 sensor does not provide bus termination. The bit‑rate is by default 125 kbit/s. The model 543 transmitter by GP:50 (USA) features CANopen and J1939.